17 December 2014 - Morecambe and Wise reborn! This affectionate and very funny homage to Morecambe and Wise, the greatest comedy double act that Britain has ever produced, vividly brings back memories of a kinder, bygone era. This strictly limited West End season follows the show's critically acclaimed, sold-out first run at the Edinburgh Festival Fringe. 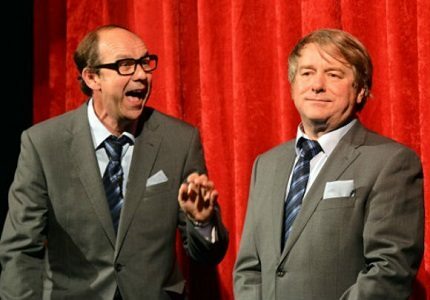 Creator / performers Jonty Stephens (Eric) and Ian Ashpitel (Ernie) recreate some of Morecambe and Wise's greatest television and stage performances, alongside new material of their own. It makes for a brilliant comedy that lovingly and convincingly recreates the all-ages appeal of the legendary duo in their heyday.